Well we’ve made it through another year and I hope all you live band musicians out there have had a good one. I know it’s been an interesting year for me. I’ve played some great gigs and I’ve had my share of problems in my live bands this year. All in all I can’t say it was the best year of my career as a live musician but it hasn’t been terrible by any means. Probably the greatest thing I did this year was start a live band project with my three oldest sons. Stay tuned and watch for my sons and I to be playing a gig very soon. I figured to celebrate the end of 2009 here on Live Musician Central I would post up a list of the most viewed content over the year. It’s no surprise that my custom programmed Fender Cyber-Twin SE preset patches take the top honors. I’ve been programming my own effect racks for almost 20 years and I used that experience while programming my Fender Cyber-Twin SE amplifier. It stands to reason that every post associated with my Cyber-Twin SE amplifier downloads would be in the top viewed categories as well. So I decided to include the Amplifier Preset Downloads page at the top of the list and fill out the rest of the list with other topics that were the most popular but not related directly to the Cyber-Twin SE preset patches. 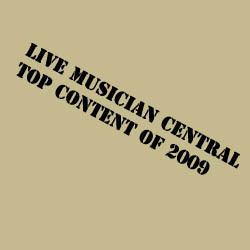 The following list is the top viewed content on Live Musician Central for the year of 2009. I’m glad that so many people have visited and I hope that you’ve all found something useful here on Live Musician Central. Here’s to a fantastic and excellent 2010!